Is there any way I can sum up some specific part of my business expenses? You can use both the Global Date Filter and Local Custom Filter to sum up a part of your data under certain conditions. Please, click the Edit button in the Global Date Filter box in the top-right corner of the screen. 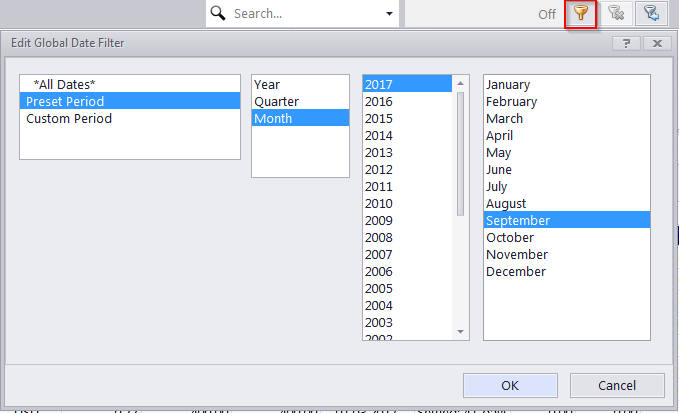 Choose Preset Period > Month > Year number > Month name and click OK. In this case, while calculating the total, only the chosen month's expenses will be taken into account. To use the the Local Custom Filter click the Advanced button at the botton of the table, set filter parameters to specify the needed business expenses and calculate the appropriate total.